CoolSculpting© is a revolutionary non-surgical contouring treatment that freezes stubborn fat, which then is naturally shed from your body. No needles, no special diet, no supplements, no surgery and most importantly, no downtime. It’s FDA-cleared and delivers undeniable results. Here at Esana Plastic Surgery Center and Medspa in New Haven CT, you will receive a cosmetic consultation from one of our physicians, Dr. Davila or Dr. Pan to ascertain where CoolSculpting can be beneficial on your body. Treatable areas include: around your abdomen (including your love handles and muffin tops), your back area, your arms, and your outer and inner thighs. During a consultation you’ll learn how it works and how much it will cost, as it is based on the amount of areas you want treated. The revolutionary technology behind CoolSculpting© was born from the simple observation that children who ate a lot of popsicles had dimpling in their cheeks due to a loss of fat from the excessive exposure to cold. This idea led to the innovative cooling process developed by scientists at the Wellman Center for Photomedicine at Massachusetts General Hospital in Boston, a teaching affiliate of Harvard Medical School. With more than 140,000 treatments performed worldwide, CoolSculpting© is safe and effective. ESANA now offers CoolSmooth™ for fat reduction of the outer thighs, an exciting addition to the CoolSculpting© product line. 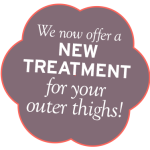 CoolSmooth is the first and only non-surgical solution clinically proven and designed for fat reduction of the outer thigh. ESANA is one of only a few facilities in Connecticut that offers this treatment. The CoolSculpting procedure results in a noticeable and measurable reduction of fat in the treated areas. Most patients can start to see results as soon as three weeks following treatment, with the most dramatic results occurring over a period of one to three months. Every patient is unique, so patients are encouraged to talk to their physician about a customized treatment plan as part of the initial consultation. Additional treatments in the same or multiple areas may enhance the desired aesthetic effect. Using a technology developed by Harvard scientists, CoolSculpting targets and freezes fat cells causing their natural removal from the treatment area. It’s completely non-invasive so there is no cutting, no needles and no anesthesia. Patients typically read, work on their laptops, listen to music or relax during the procedure. CoolSculpting is FDA-cleared for the outer thighs, chin, arms, abdomen, flanks, inner thighs, and proven safe. Some patients may experience temporary pain or discomfort. We can talk to you more about what to expect during and after treatment when you meet for your consultation. During your consultation, Dr. Pan or Dr. Davila will discuss how much time should be allotted based on your individual treatment plan. A typical treatment can last between 35 minutes to two hours. The price for CoolSculpting varies, depending on your areas of concern, the number of treatments needed and your ultimate goals. We would need to assess you in person to help estimate the cost. Typically, you’ll see a noticeable reduction of fat in the treated area after one visit, but you may appreciate even more fat reduction with additional treatments. CoolSculpting results are lasting, as long as you maintain your healthy lifestyle. The fat cells that are naturally shed by your body after CoolSculpting do not return. CoolSculpting is not a weight loss solution for people who are obese, or a substitute for surgical methods such as liposuction. Good candidates have noticeable bulges in certain areas they’d like to get rid of. Dr. Pan and/or Dr. Davila will determine if treatment is right for you during a one-on-one consultation. Call or email us today to set up your consultation. 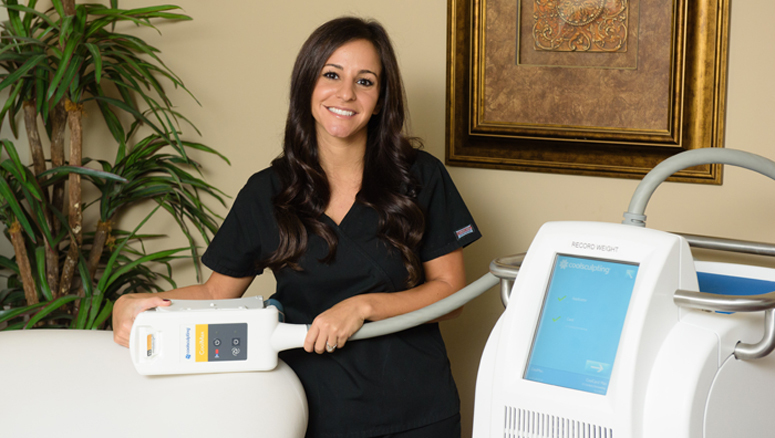 We’ll see if you’re a good candidate for CoolSculpting and work with you to develop a treatment plan. Visit us at our two convenient offices for CoolSculpting in Guilford CT and CoolSculpting in New Haven CT.